March 6, 2018 A company that will create Carroll-specific craft beers is opening its doors this week. 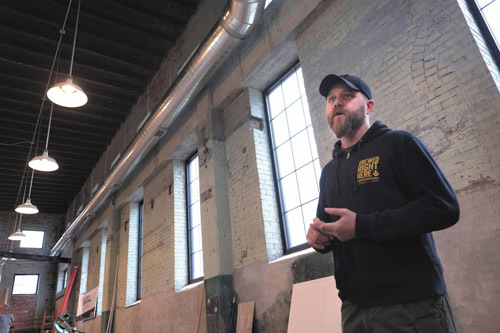 Carroll Brewing Company will open its taproom at 4 p.m. Wednesday after spending months remodeling a former steam plant at the corner of North Clark and East Fifth streets. Although the taproom will offer Carroll-area residents and visitors a chance to sit and drink local craft beers and other beverages, the business’s main function will be to brew three “core beers” that will be distributed and sold in restaurants, bars, stores and gas stations throughout Carroll and surrounding counties. Click here for the full article. Lt. Gov. Kim Reynolds headlined a ground-breaking Thursday afternoon for St. Anthony Regional Hospital’s modern, two-story, 36-unit assisted-living facility, a $10-million project scheduled to begin serving residents in June of 2018. St. Anthony plans to go out to bid this fall on the project, and is already compiling a waiting list of potential tenants on a first-come, first-serve basis. See this article and more local news on the Daily Times Herald website.